A dichloromethane extract of air-dry leaves of Alstonia scholaris (L.) R. Br. contains a mixture of cycloeucalenol (1a), cycloartanol (1b) and lupeol (1c); lupeol acetate (2); and betulin (3). 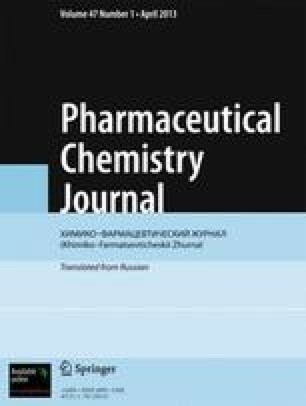 The structures of these triterpenes were elucidated by extensive 1D and 2D NMR spectroscopy and confirmed by comparison of their 13C NMR data to those reported in the literature. A previous study reported that the powdered leaves of Alstonia scholaris produced a highly significant decrease in blood glucose and a mechanism of this action was upon insulin triggering and direct insulin-like effects. Betulin and lupeol acetate were reported to exhibit hypoglycemic activity. Thus, only a mixture of 1a – 1c was tested for hypoglycemic potential using the oral glucose tolerance test (OGTT). A possible hypoglycemic activity was observed for a mixture of 1a – 1c at a dose of 25 mg/kg BW administered orally to normoglycemic mice. An erratum to this article is available at http://dx.doi.org/10.1007/s11094-015-1240-x. A research grant from the Department of Science and Technology is gratefully acknowledged.